In need of adjustable control arms to align your lowered car? 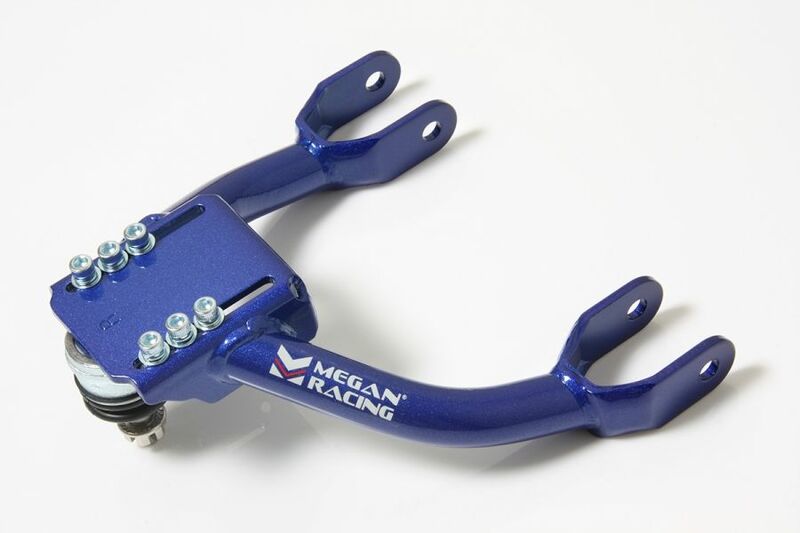 Check out these Megan Racing control arms we offer. Car alignment is absolutely crucial when modifying your car. Secondly alignment can effect every aspect of your driving experience, from straight line stability, under steer, over steer, acceleration, braking and tire wear. Although stock components allow slight alignments from the stock suspension settings, they often are not able to properly align the car after the suspension has been modified. Most cars are set to have understeer for optimum tire wear at stock height. Once you lower the vehicle ride height your camber settings are going to change. Megan Racing has developed reinforced and adjustable control arms to accommodate the needs of the aggressive and performance oriented tuner. Being constructed of a Lightweight Steel-Alloy which is able to withstand the stresses of extreme competition. Additionally these control arms are powder coated with a 3-Stage process to ensure durability and protection against the elements. Driven By Style has been a Megan Racing dealer for over 10 years. We have the experience to answer any questions you may have on Megan Racing suspension upgrades. In conclusion we are standing by to assist you with anything you may need. In other words we aim to be your one stop shop for Megan Racing suspension upgrades.